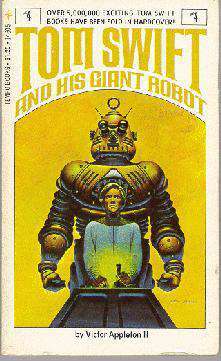 The biggest invention in this book (in more ways than one) is the Giant Robot. Tom built the Giant Robot for one reason: to do repairs and maintenance work in the radioactive parts of his father's atomic laboratory. There aren't a whole lot of details as to how the robot works or is put together, but in general we can get a pretty good idea of the author's ideas. Tom Swift built two robots: the first one was named Ator to represent the fact that he was "both atom and robot"; the second one was called Sermek "in honor of the field of servomechanics". "The relotrol will be operated by frequency modulation, just like FM radios. The signals will have nothing in common with radiation and the robot won't be confused." Even without its "head", the gleaming, silver-gray automation stood seven feet tall. Tomasite, the young inventor's wonder plastic, covered every part of its frame except the joints. These were enclosed in "sleeves" of fine Tomasite chain mail which stretched and contracted with the movement of the joints. "I suppose the transmitting and receiving antenna will be in the head?" Mr. Swift asked. "Right, along with the television 'eyes' and radio 'ears'. After the giant's head is on, he'll be remotely controlled. Right now," Tom went on, pointing to a cable protruding from the back of the robot's neck and running to a control panel on the wall, "I have to use a direct control and monitoring method." "What can your giant do so far?" Mr. Swift asked. "Walk, and do almost anything with his hands. Want to see him thread a needle?" Mr. Swift smiled. "I'd rather watch him walk." "Okay. Here goes." Tom set the panel for "walking" and slipped the punched take to control arm and hand motions. He explained that the perforated tapes, which would be used for the robot's various actions and motions, operated on the same principle as a player-piano roll. 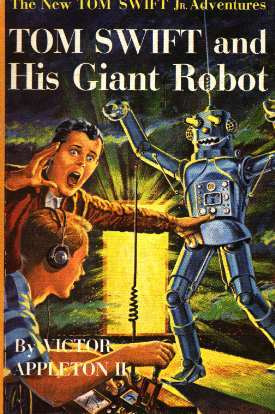 The young inventor turned a key to open the relay circuits in the robot and the giant's machinery began to hum. At the same time, its body broke out into a blaze of dazzling colored lights. Mr. Swift roared with laughter. "A real show with lights. What are they for?" "I installed bulbs of various colors at the joints to tell me how the circuits are working," Tom explained as he snapped off the laboratory lights. Mr. Swift chuckled. "Looks like a Christmas tree." "But who ever saw a walking Christmas tree?" Tom grinned. "Watch this!" He advanced the "walking" dial on the control board a few notches. Slowly the robot lifted his right foot. The foot moved forward, paused, and came down with a crunch. Memory tapes in the control panel sent a signal to the other foot, moving it just far enough to avoid toppling the body. Step by step, the automation moved forward. ÖThe final assembly of its [the robot's] metal body was taking place and Tom watched as the huge jointed skeleton was set up. Motors were being fastened in place to rigid tubular braces. To offset the heat generated by the mechanisms inside the robot body, Tom had devised a circulatory cooling system, which was now bring installed. Arvid Hanson, standing near Tom, asked, "How does the cooler work?" Tom explained that it [the cooler] was a highly paramagnetic fluid that was alternately magnetized and demagnetized at a rate controlled by a thermostat. "It keeps the robot's inside temperature at 96.4 degrees," Tom added. "I see," Hanson said. "But what about protection from outside heat--the kind your robot will have to withstand in the atomic energy plant?" "Oh, I'm using asbestalon," Tom replied. This was a material composed of asbestos fibers in a plastic matrix. Hanson was shaking his head. "When I make a model of this robot for your office," he said, wincing, "it'll be some job to get that chain mail you're using over the moving joints down go scale." Ö"the phosphors on the screens of the camera tubes were sensitive to the invisible but powerful radiation produced by the radioactive materials in the pile. This intense radiation would fog the picture on the iconoscope face and literally blind the robot. ÖFinally, the young inventor set up a series of mirror light baffles. These caught the visible light and reflected it into the rube while absorbing and deflecting the harmless radiation. Thus the screen was protected. How feasible is it to build a Giant Robot? From what I understand, there are a number of modern-day Giant Robots on the market. The robots I've seen pictures of in scientific magazines are rather large, extremely heavy, vaguely humanoid, expensive, and somewhat extensively programmable. Trying to create a duplicate of Tom's robot would present special problems, however, in terms of both maneuverability and radiation. How can you design a robot that maneuverable that will work in areas of heavy radiation? There would, I think, be some problems there. The majority of the problems would be in the robot's maneuverability -- from what I've seen and heard, today's robots are huge, slow, contraptions that must be treated gently. You could never play a tennis match with them, as Tom did, or engage them in a realistic wrestling match. And you can also forget about trying to do any complex chemistry experiments with them -- they just cannot be controlled that delicately. Still, I'm not saying that it can't be done. Perhaps it could, if there was sufficient demand for such a robot and sufficient expertise to build it. It would prove to be a challenge, though. How much impact would a Giant Robot have on civilization? It is hard to say if there is a demand for a Giant Robot or not. Perhaps, if one was built, someone could find a way to use it, but it would depend on things like its price, its weight, and fuel demands. Even if it were cheap, though, I think that only a very limited number of them would be sold -- if any. Why? Simply because most modern day tasks that require robots can be done with ordinary machines or robotic arms. If one needs a robotic solution one goes to a robotics firm, tells them what one needs done, and then the firm custom-builds a machine that can do what one needs it to do. An all-purpose robot that can handle any number of tasks would only sell well if it were cheaper than using a human to do the job. There is one kind of Giant Robot that might find an enormous number of uses, despite potentially high costs. That would be a robot equipped with a really good Artificial Intelligence system, in other words, the classical Science Fiction robot. Tom didn't invent one of these, though, and I can certainly see why; Artificial Intelligence is not an easy field to deal with. Another invention that is worth mentioning is Tom Swift Sr.'s atomic laboratory, the Citadel. The Citadel, which appears in numerous other Tom Swift books, is an atomic laboratory built and designed by Tom Swift Sr. Its purpose was simple: it was to take normal uranium, bombard it with nuclear particles to transform the uranium to different metals (plutonium, for example), and then separate the metals made so they could be sold. ÖAt last Mr. Swift led them to the main structure, built of white cement. Inside was a corridor extending around four inner walls of lead and concrete. On one of the walls was a relay and television board for messages to and from the robot as he worked in the inner room. The main remote-control panel was in a separate building. "Tom, I expect your giant to be able to feed slugs of uranium to the oven if necessary," Mr. Swift said. "He'll do it," Tom assured his father. "Now we'll take a look at the heart of this building," Mr. Swift said. In the huge interior section was a mass of square lead and concrete pipes arranged longitudinally. "Looks like a mammoth honeycomb," Hank remarked. "I suppose the slugs of uranium are fed to the pile through these." "Correct," said Mr. Swift. "The heart of the reactor is in the center. In there the uranium will be bombarded with neutrons and changed into the various transuranium elements. Then the slugs are taken from the pile and the robot separates out the new elements in his own completely equipped chemistry lab over there." He pointed to an enclosure whose walls were lined with the necessary chemicals in radiation-proof containers. "After that, he prepares them for shipment to medical and scientific institutions." "And where will the waste products--such as the slug casings--go?" Hanson asked. "Tom's robot will carry them out through a tunnel to an underground lake we've made. In that way, no living thing can be contaminated by the radioactive waste." Next, Mr. Swift took them outdoors to a small concrete structure located at a short distance from the pile plant. "This is where Tom and the other operators will receive reports from the robot and send him orders," Mr. Swift explained. From the outside the structure resembled a gun pillbox more than a control house. Within, however, the function of the building was obvious, with its large color-television screen, surrounded by loudspeakers and banks of oscillographs. Control knobs and buttons were set into a huge desk-height panel. Hank Sterling and Arv Hanson examined the large racks of amplifiers with interest. Tom now showed them the tape library. "These tapes will be a real boon to the robot's operator," he said. "They'll do away with the necessity of direct control on routine acts and motions of the robot. In fact, we can feed in any of more than a thousand different tapes with directions to get him out of every difficulty we've been able to foresee. But when something unexpected comes up, the operator will have to take over." How feasible is it to build a Citadel? While I have not heard of any laboratories that perform the Citadel's job, I would assume that, somewhere, there is a plant that does exactly what the Citadel does. After all, plutonium is a man-made metal; surely it has to be made somewhere! Ö"The pile feeds on slugs of uranium-238, which is nonfissionable. In the pile a portion of it is slowly converted into plutonium. Now if you feed the pile a slug containing a high concentration of plutonium, it could set off an explosion before the moderator material ever had a chance to quench the reaction. I think one of those slugs has been loaded with plutonium." There is another invention in this book that, while not invented by Tom, is certainly worth mentioning. That invention is called the Mechanical Crow. 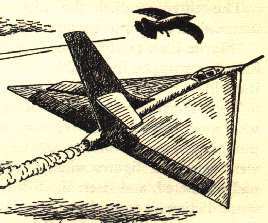 The Mechanical Crow was a small steel remote-control rocket, roughly the size of an eagle, which looked like a crow. It certainly didn't act like one, though -- its main job seemed to be overpowering the guidance systems of Swift aircraft and then hijacking them. In appearance, it wasn't much -- just a simple rocket with a few attachments that served to make it look like a crow. It didn't look terribly convincing, but I suppose it didn't have to be -- just as long as the pilot was momentarily fooled, the design was good enough. The inventor of the crow put in a very thoughtful precaution -- dynamite. A simple "seepage-diffusion chemical time fuse" set off the dynamite. The dynamite didn't keep Tom from probing the secrets of the mechanical crow, but it did make things exciting! According to Tom, the crow had a rather unusual design. The crow's radar was located in its 'feet', with the crow's talons serving as a meshed radar screen. There were a number of other features in it -- a coordinator, a unique gyroscope, and some other equipment that the book didn't go into any details about. Personally, I have my doubts as to the possibility of building a mechanical crow. Just how does one overpower the navigational system of a plane with electronics and radio signals? Perhaps, given enough time and money, it could be done, but I have very serious doubts. If its job was to confuse or destroy a plane's navigational system, sure, I could see that happening (remember the warnings on aircraft to turn off all electronic devices shortly after takeoff and shortly before landing?). But to take it over? With something that small? I don't think so. This book is one of the few books that pays homage to the Tom Swift Sr. series. Early in the book, when Tom is sitting in his Father's office, it says: "Back of Mr. Swift's desk hung pictures of faraway places the elder inventor had visited in his younger days. Beside him, in a vast glass cabinet, were bronze models of a dirigible, a great searchlight, a war tank, and a model of a small motorcycle." All of the machines that Tom saw bronze models of figured very highly in some of the Tom Swift Sr. books -- books such as Tom Swift and his Motorcycle, Tom Swift and his War Tank, Tom Swift and his Big Dirigible, and Tom Swift and his Giant Searchlight.